Sometimes whether it is for backup purposes or for hosting, you will want to move your photos stored in your Apple Photos application library on your Mac to an external drive instead of the startup boot drive. Making the change is simpler than you think. First, quit the Photos app. Next, copy the entire Photos Library by dragging it from the startup volume to the external volume that you want to move it to. After you have completed the transfer, hold down the Option key while you launch the Photos app again. 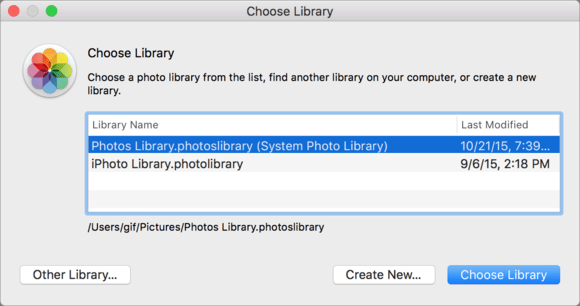 Now after the Photos app launches, release the Option key and go to Photos > Preferences. Under the General tab, look for Use as System Photo Library. Here you can select your backup external drive as the default photo storage. You will need to keep this hard drive connected to your Mac for the ongoing storage to work. Notice that if you also have the iCloud Photo Library enabled, the process may take longer even if the photos were already backed up to the cloud. If you wish to copy the files over and delete them from the original source, you can do this by dragging files over while holding down the Command ⌘ key.